Does anyone else feel that June is just flying by? I can’t believe school is out and we are heading into the last week in June. This week was not as productive as I would have liked. I have one piece that I will save and share with you next week because it is just not done. My day job has been super busy which is cool but it is cutting into my DIY time. I want to share my favorite piece to date. 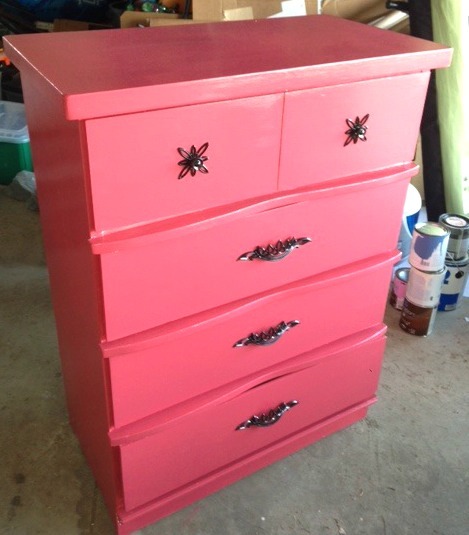 I worked on this dresser for my daughter’s room. Though Emma has a beautiful dresser and one of the more expensive furniture pieces we purchased – there is just not enough space to hold all her clothes anymore. 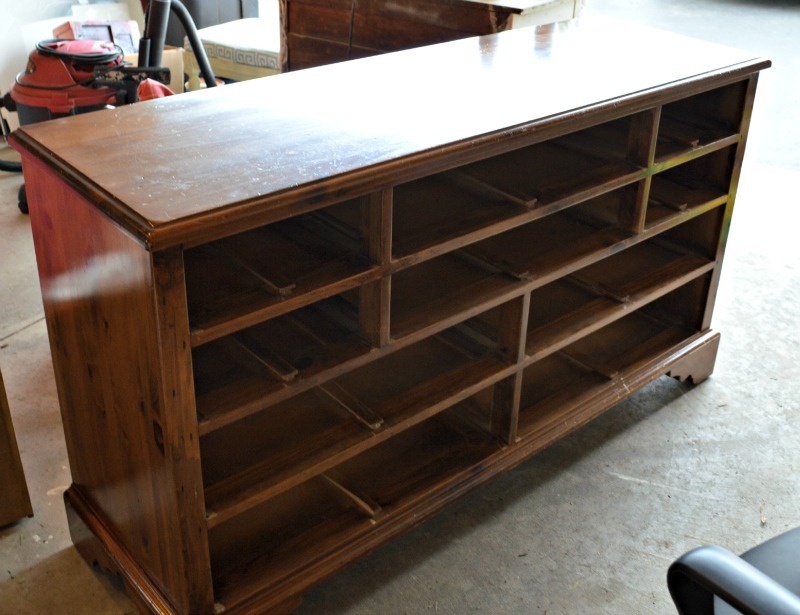 So one morning I received an urgent call from my sister that she found these great dressers for me – I dropped everything because my sister knows my taste and went over to the neighboring town to check it out! There were 2 dressers and the mirror, which is now over my mantel, all for $75 dollars! I was sold. 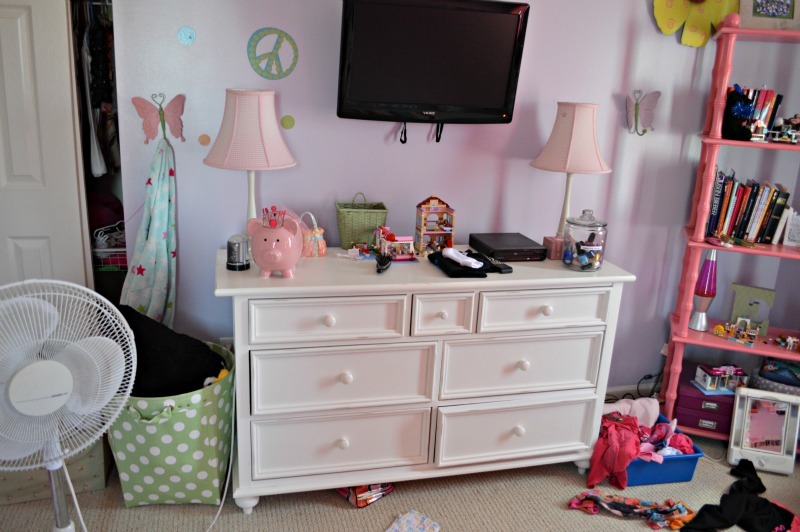 Now the hard part – talking to the Hubby about switching out the dresser – normally Steve lets me do what I need to do…which I love – but the dresser is really heavy and will need his help moving it into Emma’s room. 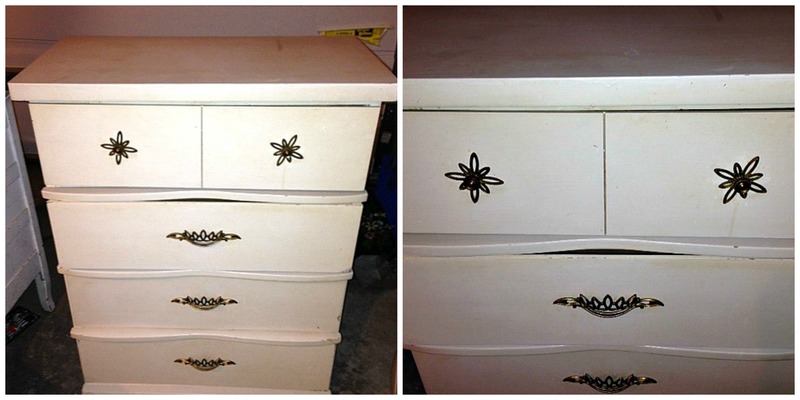 The dresser has to be from the 70’s based on the style and dark finish that was on the piece. 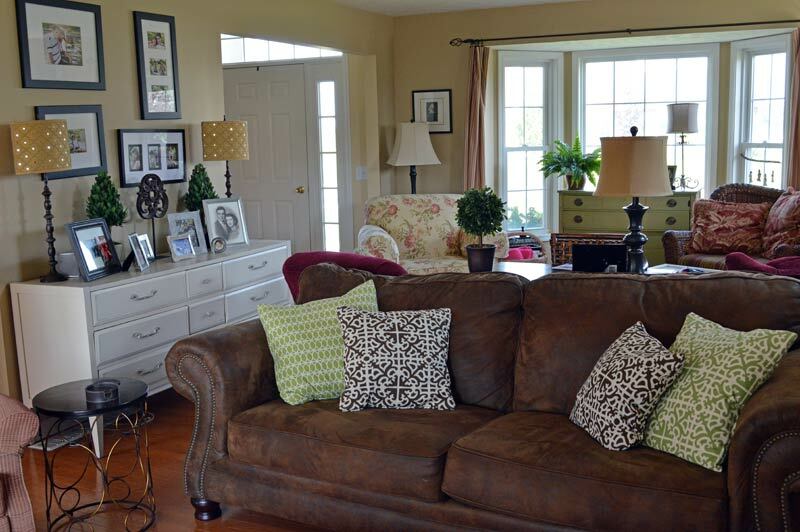 It had some wear and some distressed areas – so Annie Sloan paint to the rescue! 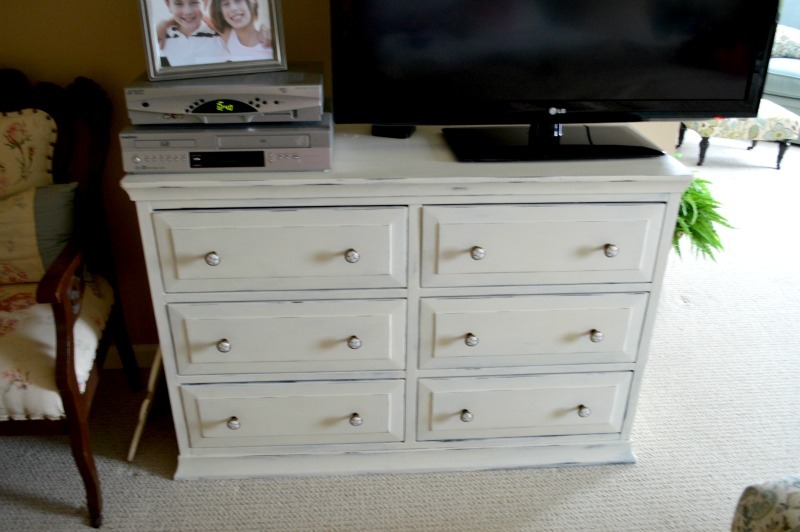 I went with old white – because Emma’s room is so eclectic and has and will have many different painted furniture pieces I wanted a piece that would ground the room since the dresser is so big! 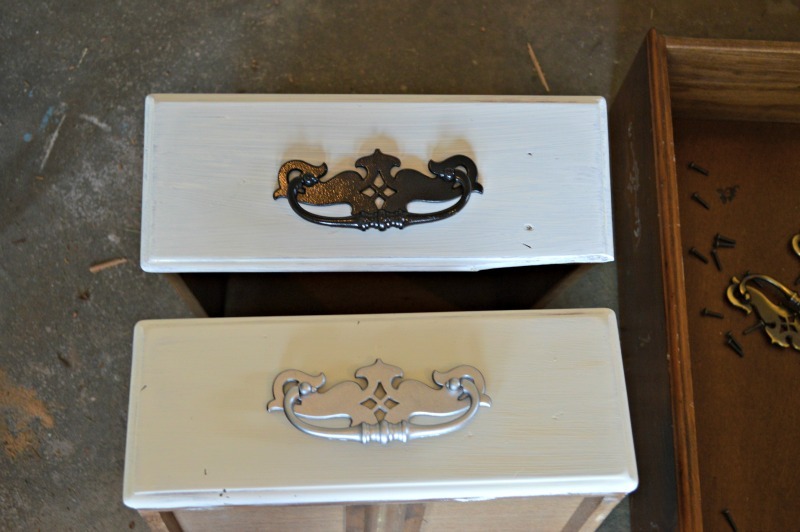 Then came the fun part – what color should I spray paint the hardware – I have been lucking out that the hardware lately has been the right style that I just had to make minor changes and not invest in new knobs- which can be pricey. So I was not sure if I wanted to paint them black or silver so I made an experiment and painted one each a color and tried against the dresser and silver won out. 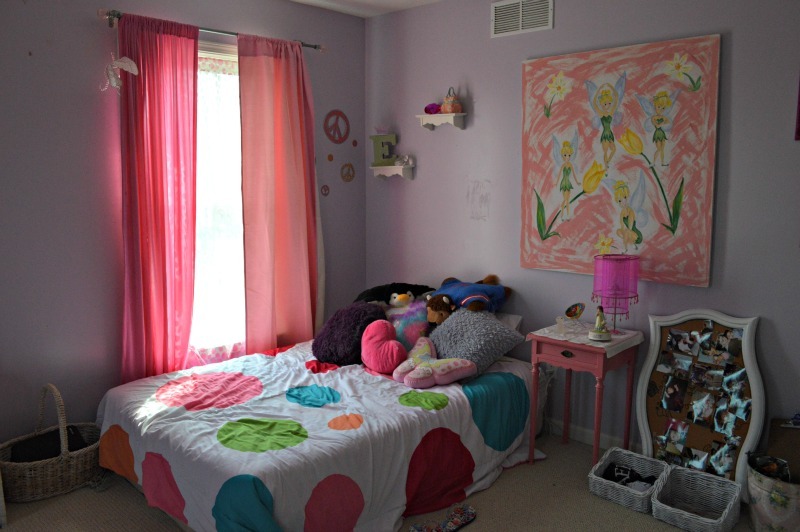 I think for it being a young girls room it is subtler as well. The hardware came out awesome I really love the finish this paint spray paint leaves, Krylon’s Metallic Brilliant Silver . So the dresser came out wonderful – in the anticipation of the move – Emma and her girlfriend decided to rearrange her room without me! Deep breath! But I have to admit it looks awesome – here are the shots from her room with Emma leading the design effort – I did not do any staging right now! 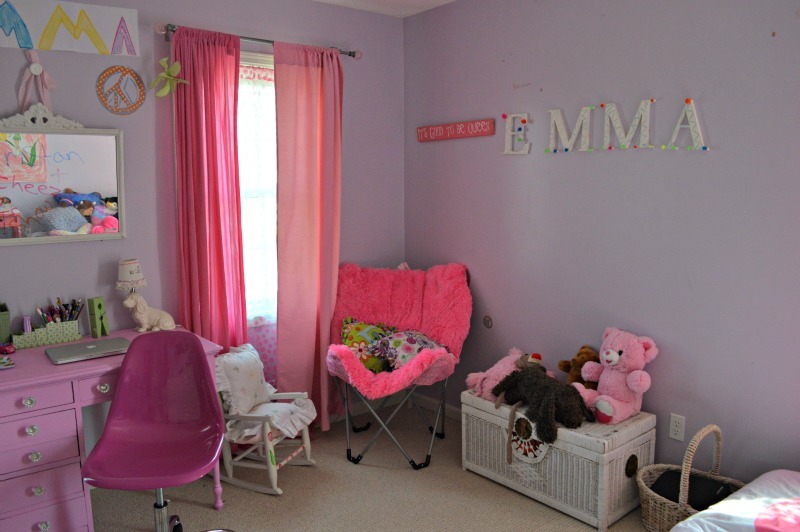 Emma’s room is going to be a large project this summer! I am looking forward to working with her as we select new paint colors; learn how to stripe a wall and maybe new curtains and definitely a new headboard design by Emma. What has been your favorite DIY piece to date? Today we are partying over with Beneath my Heart – Best DIY Projects of June! I am really excited that summer is finally here and I am going a little crazy brightening up my house! I love color and I am taking advantage of our short summer to bring some of that brightness inside. Looking at all the wonderful homes during the summer tour over at Gina’s blog The Shabby Creek Cottage totally inspired me. That is when I decided to brighten up my living room area. The original plan for our house had a separate living room and family room separated by a pocket door. When we toured the model home my Hubby and I decided it made each room too small. We chose to have one large room instead. I have separated this large room into two sections: one more “formal” sitting area and an informal area where we watch TV. The TV area has two large brown couches so I decided to attack that side first. My main idea, instead of buying new pieces and driving my husband nuts, was to brighten up the room by using my favorite Envelope pillows. I chose loud bright colors that are lime green with different geometric shapes. I also added some brown patterned pillows (I know brown is not bright) but these pillows have a great pattern with some white blended in. 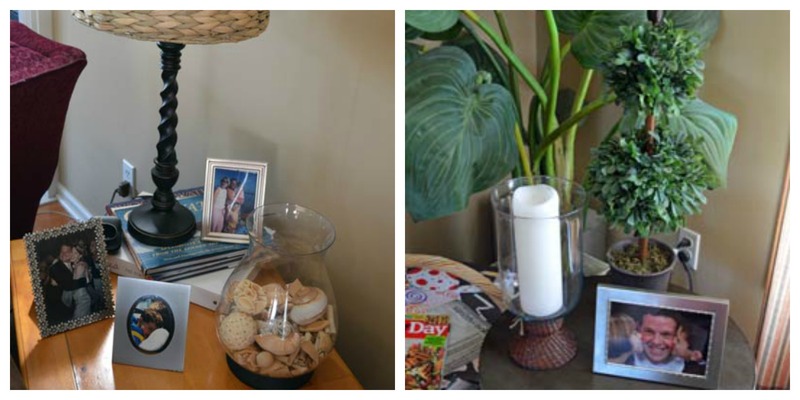 I added a glass hurricane lamp that I filled with seashells, which I originally wanted to place on the ottoman. My Tasmanian devil kids like to jump and lay on the ottoman so I knew if I put it there it would be broken in two minutes. So, I put it on a side table instead. I also added a new lamp with a wicker lampshade to add some texture. I found a cute little candleholder that has a wicker base that ties into the lampshade. I hope to find some sea sand to put around the candle. I found this cute little white dish at Target and it has a Bee on top so I thought is would be perfect for the room as well. I am in the process of deciding on new drapes for the room. I took a Facebook poll and the results are pretty even, with the Hubby voting to “Leave it alone” as usual. I also plan to line our entertainment center with the brighter lime green pattern, but that might be a bit too bold, even for me! I have to get up the courage for that one. Has summer invaded the inside of your house yet? What types of things are you thinking of to brighten up your home? 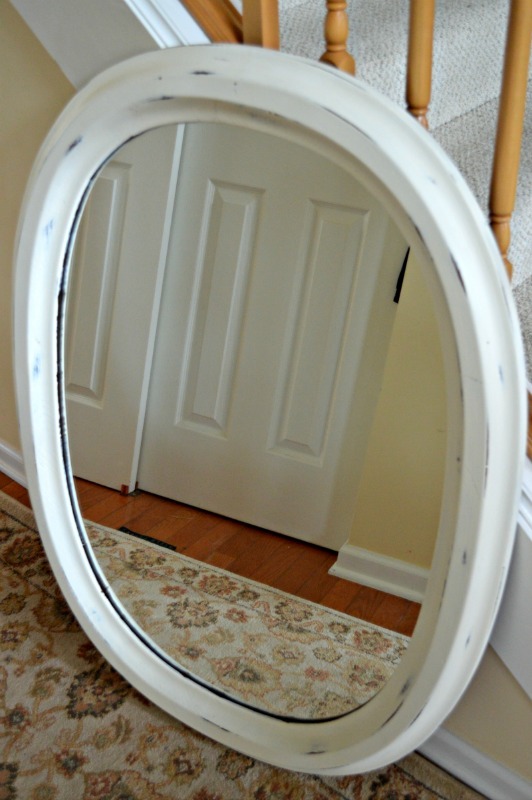 So one evening last week while we were going back and forth for soccer practice I kept staring at the distressed mirror in the garage thinking “should I sell it or should I find a place for it around the house?” It is so heavy that I could not lift it up high by myself! 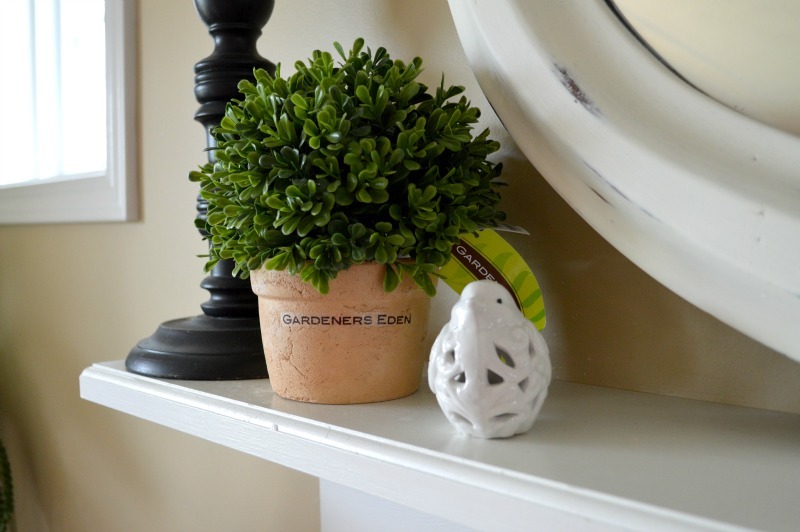 So I asked the Hubby to see how it looked on our mantel in the living room….and to my surprise it did not look bad! 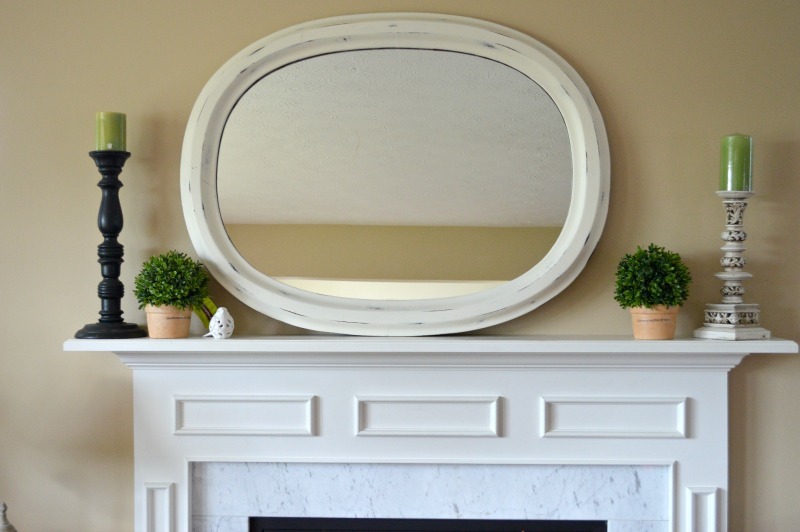 So I thought I would play around with a couple of the items that I had around the house to see what type of fun summer mantel I could come up with, and lo and behold, I liked it and the mirror is here to stay for the summer! I put this video together on how I experimented with different accessories until I came up with the look I was going for…I think it is helpful to see the thought process….it is all about giving it a try and see what it looks like….. See if you can spot the guest appearance in the video. First one to leave a comment with the correct answer on the blog will get a $25.00 Starbucks gift card! Here are some close up pictures of the mantel. See how I leverage the different hues and textures of the different elements? 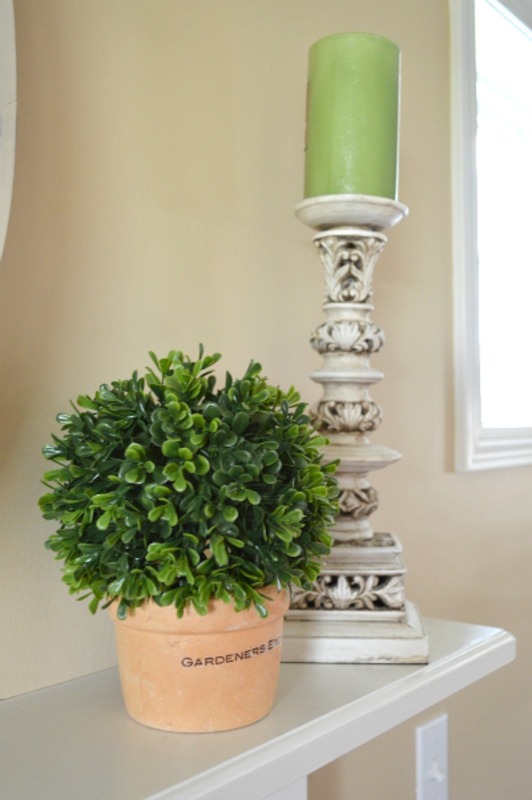 The distressed candle stick matches the distressed mirror, a pair of small topiary pots, a little bird that has a shinny finish to match the mantel and the dark candle stick to pull the distressed marks from the mirror. The important thing is to keep trying different elements until you find the blend that works. Keep at it! We are on Summer Vacation! 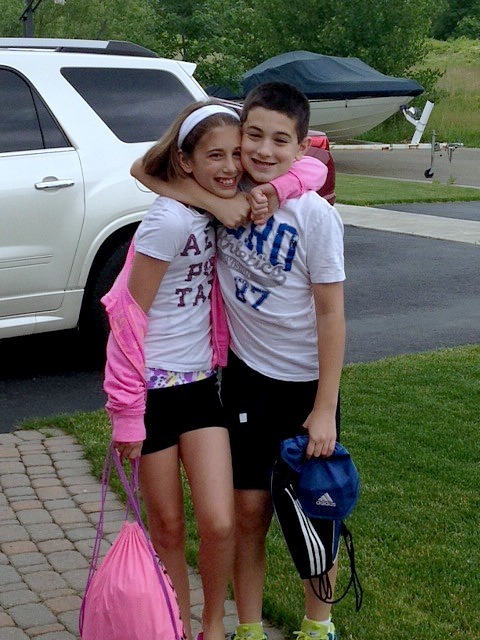 Today is the first official day of summer for my kids! We are a very excited household. This is the first time in 4 years that I will be at the house during the summer. I am very excited to be able to work my schedule to have some quality time with the kids this summer along with a very helpful babysitter a couple of hours a day so I can do my day job! Now, I need to come up with a schedule and a routine for my kids. My son would prefer to play video games 24×7, and my daughter would like to be on Netflix. Our June thus far has been a mild, rainy one so we have not had the opportunity to be outside and go for walks or enjoy the pool or boat rides very much. We have a couple of projects that the kids and I are going to work on together. Emma, my daughter, is an awesome painter, so I am going to have her work on freshening up the baseboards around the house while I paint the higher trim and doors. Also, Emma and I are taking on her room, moving it to more of a teenage room verses a tween’s room. We are going to be embarking on a striped wall project and a new headboard; more details on that later – and thoughts of patience for me please!! Peter is a great gardener so he is responsible for watering my plants and weeding our garden beds. Plus walking our dog Linus. We are also going to be tackling a reading corner in our basement – I got the idea yesterday after seeing Vintage Revivals blog where she built this awesome outdoor reading space for her kids and got inspired. Each day my kids will have over an hour of reading time. We are going shopping today to get our summer reading books. These are going to be fun novels or graphic novels for Peter. I want to make sure that reading is something they will enjoy – summer is about fun! We hope to go to our lake a couple of times this year, but as my Hubby and I were looking at the calendar our summer is full and with the various sports that my kids participate in it does not leave much time for family trips as they get older. So maybe a couple of 4 day weekends will be in order vs. a full week. I hope to put together a chore chart and a daily plan (a very unstructured one) so the kids understand what will be happening for the day as well as what needs to get done. We will see how that goes and looking forward to having the good times roll! Oh, by the way, we just got a Yo Berry here in our town – so we will be working on earning reward points for that wonderfulness – yesterday we went to celebrate the end of school and my Hubby got 15 different types of chocolate in one bowl. Insane! Let me know what you are up to – how are you keeping your kids entertained this summer? This was a crazy week, school is winding down, finals for my son and soccer games, plus Hubby is on the road! But as I mentioned in yesterday’s post I am on a dresser craze. Even with all that was going on this week I was surprisingly able to get a lot done. I worked on 2 dressers, and made a message board for a friend and made some envelope pillows for my living room. 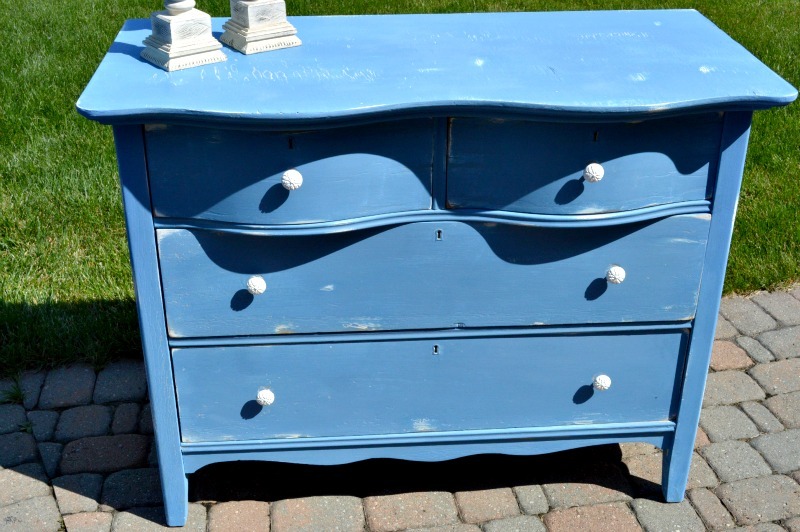 For this post I thought I would talk about the dresser and message board. 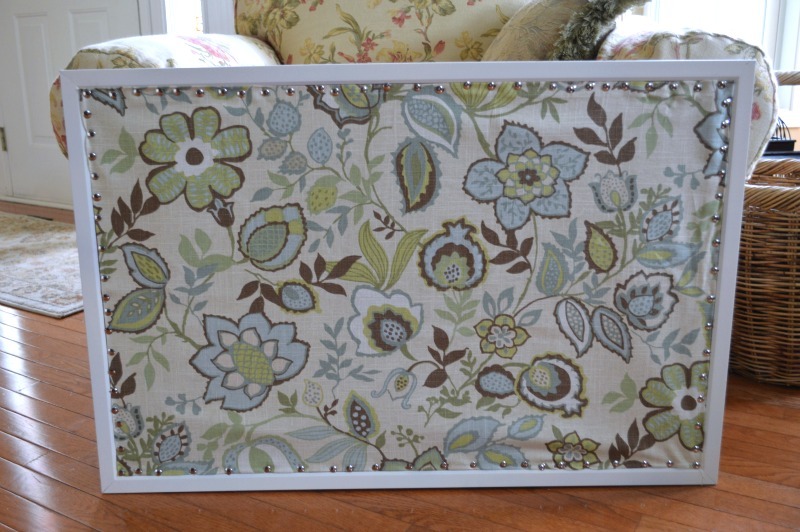 I have always been a fan of fabric covered message boards. I have been covering them for years with fabric as you see here. But while on Pinterest, of course, I came across this updated look that I thought I would try, it is a little more stylish. From the old office I had your basic large message board that I am sure I bought at Wal-Mart for about $12 dollars. 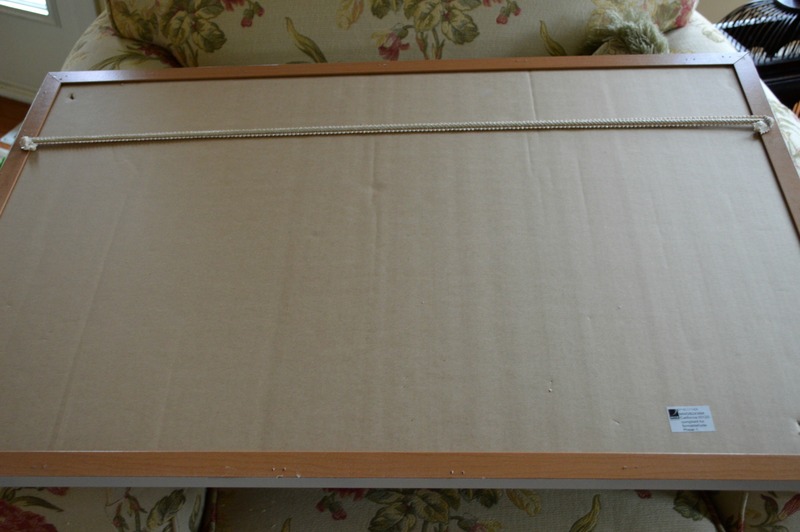 I then spray painted the board a cream color. My friend likes cream vs. white. I then took material (jut love this fabric and colors) measured the opening and then added a ½ inch all around to the measurement and cut the material. I then folded the edge and ironed it over so there was a nice edge! I know: I broke out the ironing board! This is when I really could use my mother-in-law’s help – she actually finds ironing relaxing – thank god – because I sure don’tJ! I bought really cute nail heads that you use for upholstery but they were too long and would go through the message board, so I found shiny silver tacks instead. All I did was pin the tacks to hold the material on the board, at first I spaced the tacks, but then decided to keep them pretty close together. It looked better. Finally to hang the board, I had some pretty cream fabric boarder left over from a previous project and just used my handy dandy staple gun and made sure the string was tight and stapled it onto the board, and the message board was done. I think it turned out really cute and will look great in her kitchen. I even have some left over material to make curtains for the kitchen if need be. I also worked on a great dresser. This is a solid wood, dovetail dresser that I purchased at one of my favorite vintage shops called Dot Not Shop here in Geneseo. The piece was right at the door and it was white and was just calling my name. I liked the chipped paint feel of the piece as well as the curved top and thought it would look cute in a babies or little kids room. 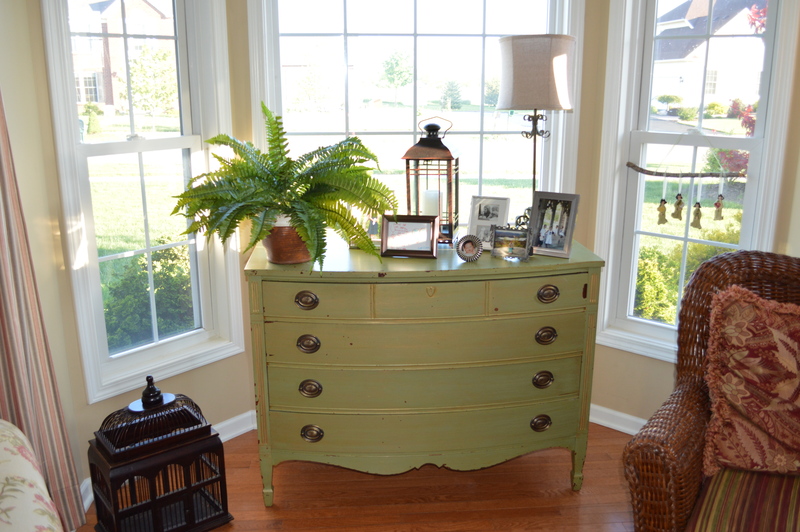 I had Greek blue from Annie Sloan at home that I have not used yet….so it was time to take that paint for a test drive! 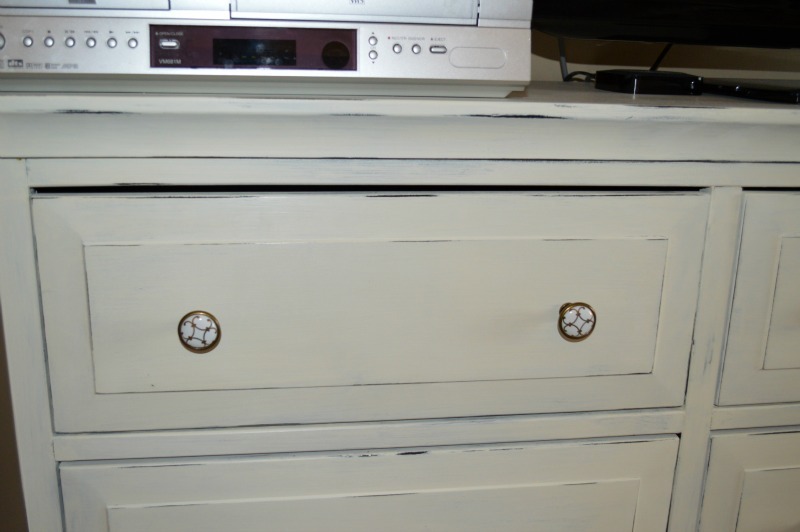 The knobs were really cute on the piece too, they were silver but looked a little tired, so I spray painted them white to pop against the Greek blue paint. Once I got it home I had to make a couple of repairs to the top…which I have to admit took time to let the glue dry and I could only find one clamp (need to buy some more supplies). I decided to prime the top just to give it a little more coverage. Then I applied the paint! Using my sanding block I did a lot of distressing all over the piece this time. I think it turned out pretty cute! Wish I had a place for it! 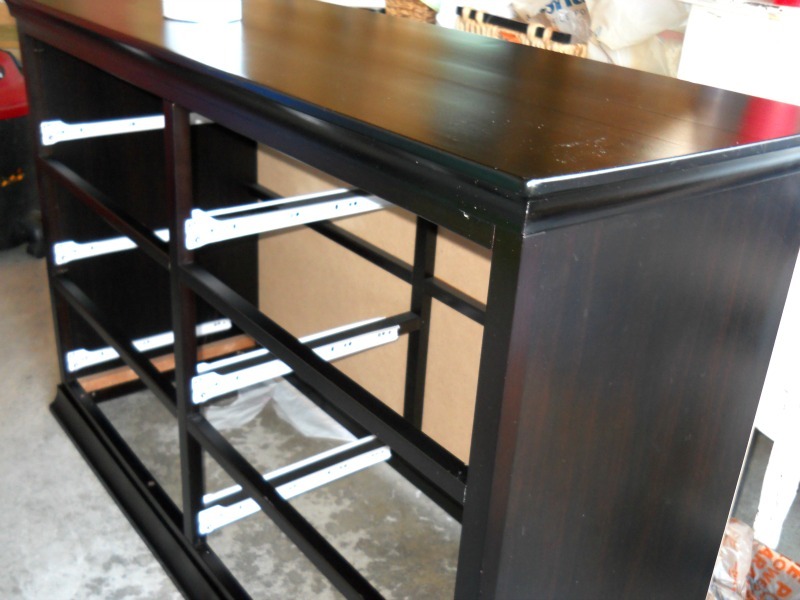 I also worked on another awesome dresser this week, my favorite to date, that I am going to put in my daughter’s room – but I will write a separate post next week I hope. I just need to convince the Hubby to help me carry it upstairs and then carry her old one down! All in all a productive week and looking forward to seeing what next week brings! I am seeing shelves hopefully being lined with fabric or painted and maybe finalizing the color in my master bathroom – so many fun decisions to think about! What projects have you been up to this week? Did you know that I have a thing for dressers? I think this past month alone I have purchased 6 – ok maybe it is more like an obsession but I just love painting them and using them throughout my house or selling them. In browsing Pinterst earlier this year I kept seeing people talking about this “chalk paint”. At first I thought they were talking about chalkboard paint and to be honest I was a little bit confused but then I read a blog about it and the light bulb went on…and I thought it looked really cool. This piece was going to go in our master bedroom and serve two purposes: A clothes dresser for me and the top would be our TV table. For some reason I need the TV on at night or I cant sleep. We had a beautiful console table from Potterybarn there for years but I needed more storage for my clothes (another bad habit of mine). 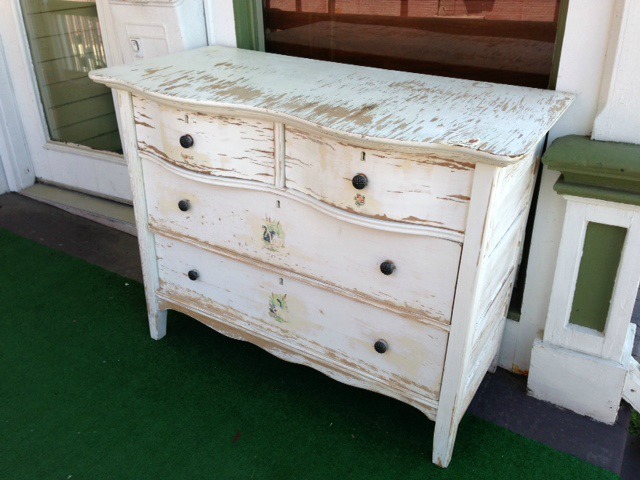 Our room is made up of a lot of white distressed furniture and I thought at first I might keep the dresser’s original brown tones but when I saw the piece and how rich the color was I thought this would be perfect distressed. The dark brown color would come through very nicely. 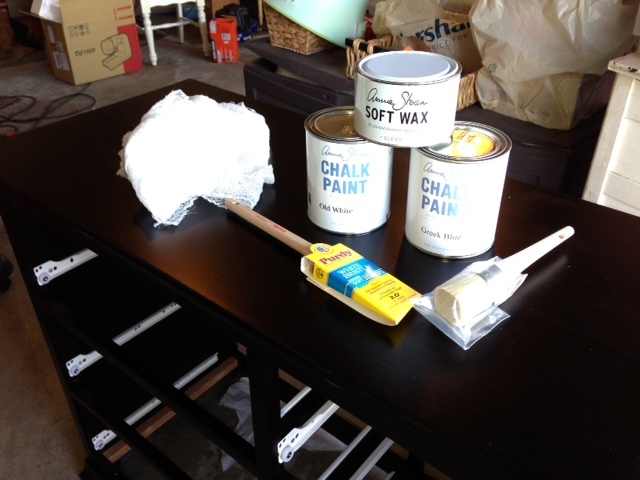 So I thought this would be a good time to experiment with the Chalk paint, by Annie Sloan. I did not know where to purchase the paint around our area, when I was searching I came across the Purple Painted Lady and that she was a reseller. Then I remembered “hey – we just drove by her store earlier today!” I saw she was open on Monday and decided to drive out and see what the scoop was on this paint. Tricia, the owner, was very helpful. I bought two different colors of paint old white and greek blue. She went over how to use the paint and how to use the clear wax. Tricia recommended for even wax coverage to purchase the wax brush by Annie Sloan and cheesecloth too. Even though the brush was pricey I thought it would be a good investment. And I am glad I did. Tricia also sent me home with some good written instructions and said to give her a call with any questions. I drove right home and broke out the old white paint. All the blogs were right in saying the paint was very think. I have painted with latex all my life so this was a different feel until you get used to it. But in watching a couple of video’s by Tricia and one by Blue Egg Brown Nest I got it down pretty quickly. I like pouring the paint into a separate container; I noticed that the air very quickly thickens the paint in the can. Tricia also suggests for the second coat to add a little bit of water to help the paint go on easier – I definitely thought that was helpful. This is another reason why you want to pour the paint into a separate container as you are using it. Then came the fun part: distressing the piece. I bought a sandpaper block at Mr. Second’s, fine grade, and went to work. 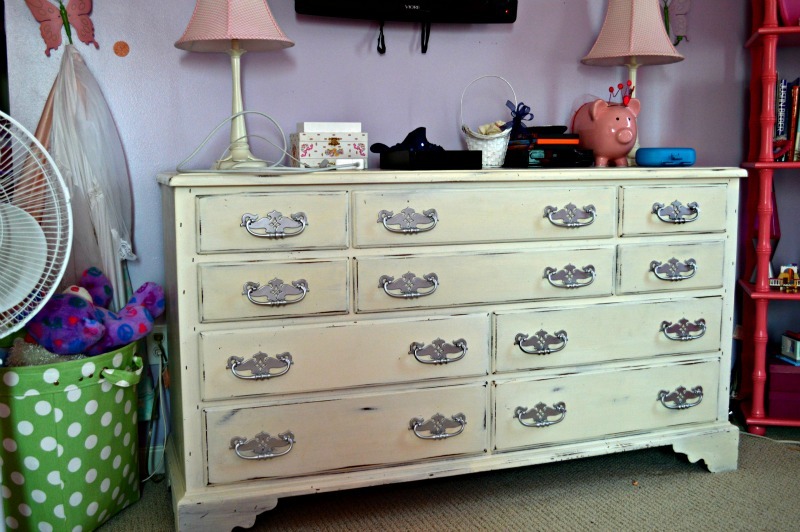 The paint distressed awesome – it is so easy. 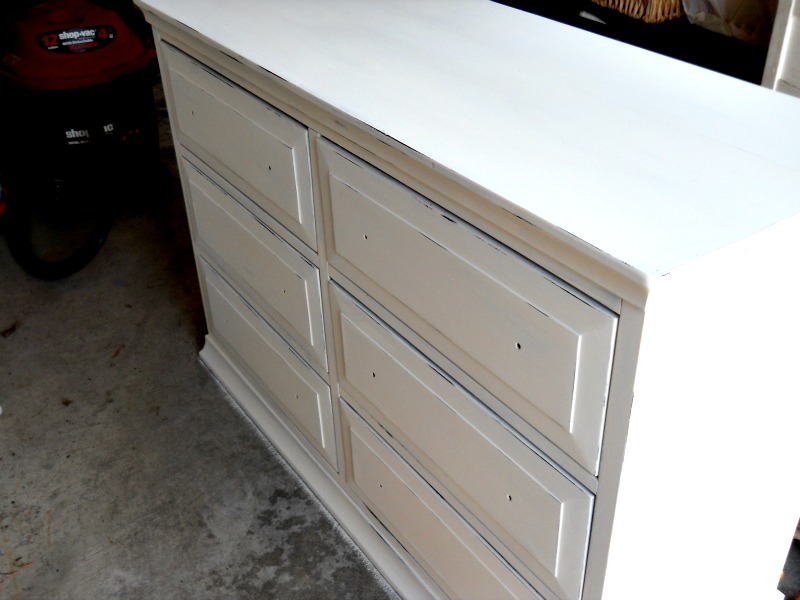 I basically distressed the corners and various parts of the edges on the dresser itself and the drawers and the dark tones of the wood came thorough beautifully! Sanding took less than 15 minutes to do the whole piece. 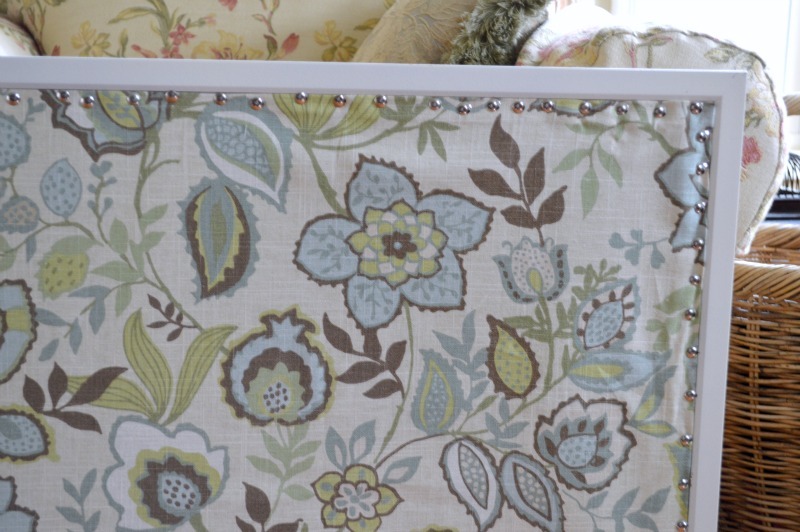 For Annie Sloan paint to finish the piece they suggest using clear mini wax as a protective layer. I have never used wax before or Poly for that matter and I was a little nervous I would mess up the piece. So back to Tricia’s directions I went. And it really was not too difficult, using the brush works great. I started in the corner and worked down and across and that worked really well. Plus it is a great workout for your arms! 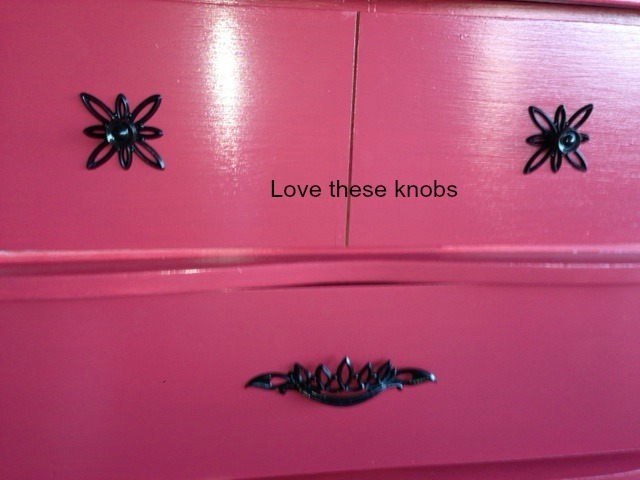 I did not end up using the knobs that came with the dresser. 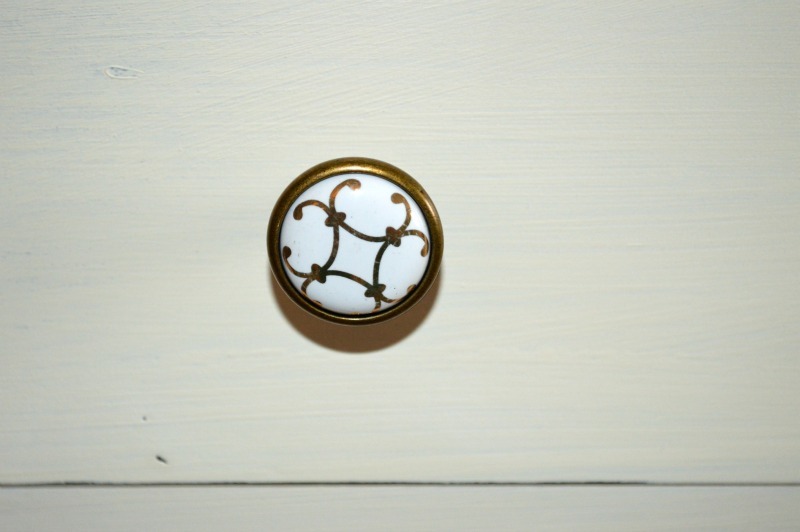 Instead I ordered some really cool brass, gold and white knobs from Etsy to go with the knobs I bought at Anthropology for another dresser in our room. The piece needed 12 knobs so the ones I found on Etsy were $5 dollars a piece vs. $12 at Anthropology. It took 2 weeks for the knobs to arrive (really helped me with my patience level) and they look great on the dresser. It is so nice to have additional storage now in our room and in such a pretty piece. I have been working with Annie Sloan paints for about 2 months now. I have painted 4 pieces: 3 distressed and one regular and really enjoy the quality and colors so far. I look forward to further developing my skill and painting other pieces. The Purple Painted Lady does ship the paint as well. Which is great since her shop is about an hour for me, I received the box in about 2 days. She has a great site and helpful hints as well. Have you tried chalk paint yet? How do you like the product? What pieces have you painted? The Peonies Are Here! The Peonies are Here! Do you look forward to a certain flower blooming each year? For me it is the Peonies! I just love them! For me when the Peony blooms it means summer has finally arrived! 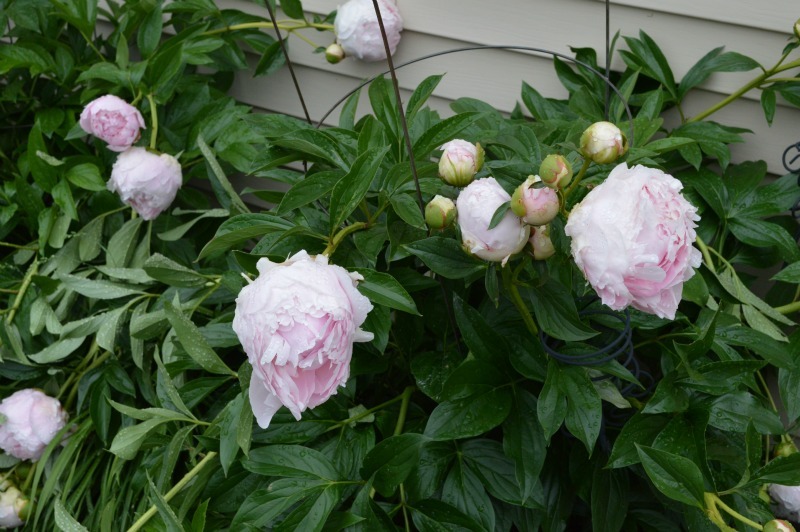 When we built our house I put in a small Peony garden on the side of our house! I have 4 bushes. The usually bloom the first week in June and last two short weeks or so! I love filling vases around my house with the flower, whether it is in a bulb or in full bloom. There is something about fresh flowers in your house from your very own garden that makes me smile. 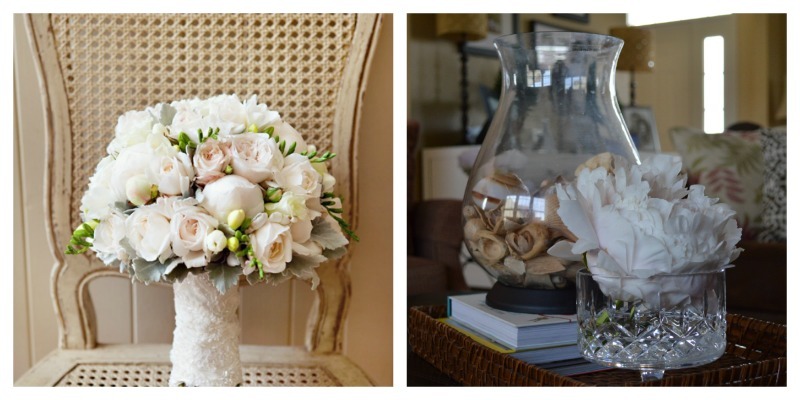 Peonies are such a universal flower, they look great in a small vase by your coffee table, to a beautiful bridal boutique….If I got married in the summer that is what I would have had – a huge boutique of peonies! I can’t believe summer is here! I am so looking forward to the warm weather, long boat rides and sitting by our pool! 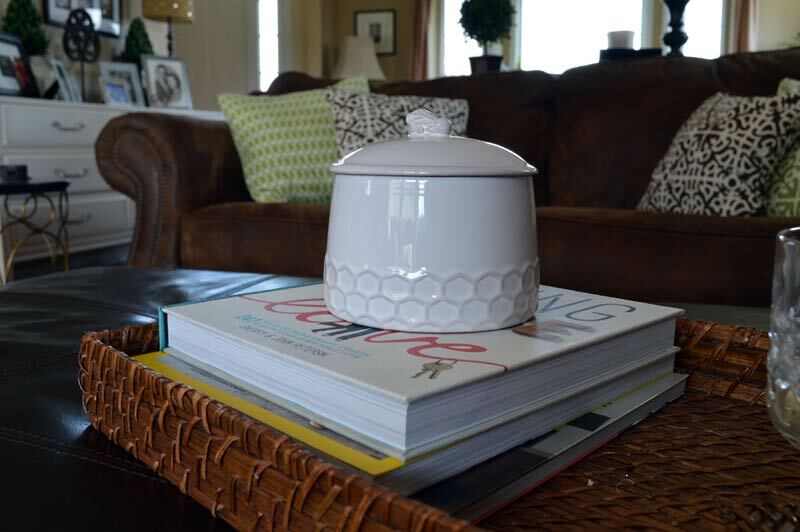 This past week I so enjoyed the Summer House tour given by Gina at The Shabby Chic Cottage. Each day we were able to see 5 bloggers homes and then on Friday we could participate in the tour ourselves. I so enjoyed looking at the tour each day – I will definitely miss those posts. But I was able to meet some great Bloggers and get a couple of cool decorating ideas. Which leads me to buying fabric today to make new curtains for my livingroom and rearranging my accessories in the space last night too – stay tuned this week for the details. 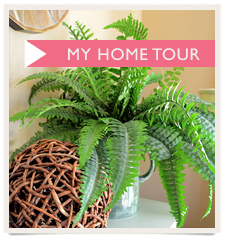 So if you have a moment this weekend check out the Summer House Tour over at The Shabby Chic Cottage, you will love it! Today I am trying out my first Link Pary! They are some great bloggers that are partipating with awesome DIY ideas. Check out the site and see what we all have been up to! This week I took on two pieces. The first was a vintage dresser. I found this piece on Craigslist. I like that is was a smaller dresser and thought maybe it would fit in my foyer. I am looking for a unique piece for the entryway. Unfortunately, it was an inch too long. The bonus was when I picked it up I loved the knobs on the piece. They were really unique. The owner said it came from the 1950’s and with the lines it definitely looked like it; Very Mad Men – I could see Peggy having it in her home. With the knobs being so different and the smaller size of the piece a loud color alarm was going off in my head… I love bright colors for furniture when I can pull it off. So, when I stopped by Home Depot I found the color Watermelon by Bauer! 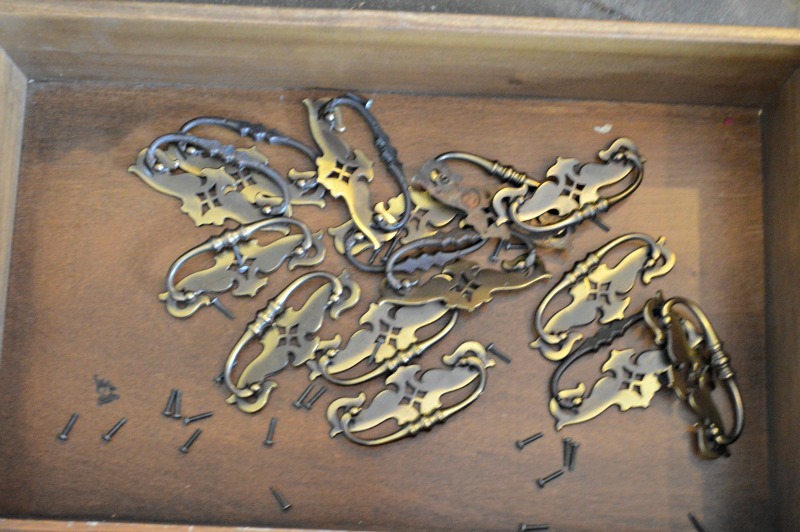 I originally thought I would keep the knobs gold – but the more that I looked at the piece and the color – I decided to spray paint them a high gloss black (think watermelon seeds). The dresser was definitely in disrepair and really smelled of smoke. I googled how to get rid of smoke in dressers and saw if you put new fabric sheets in the drawers for a couple of days it draws out the smoke. And I have to say that it worked, 14 fabric sheets later. I think because of it being in a smoking home the paint had trouble sticking to the surface in some spots. I washed it down and also put on several coats of primer. But all in all it came out really cute and I love the color – and it is going to a good home today! 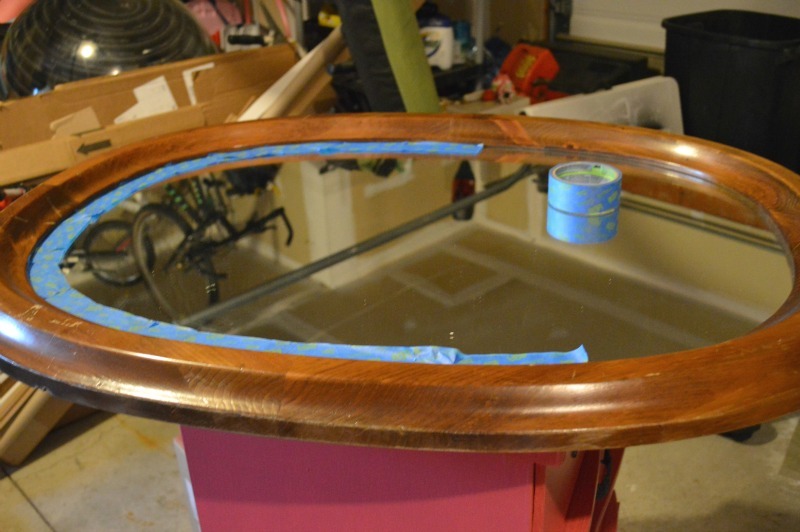 The other find was this awesome oval mirror that I bought at a yard sale. I purchased two solid wood dressers and this mirror for $75. It was a steal! My Mom talked me into the mirror, I was really against it for some reason – I have too many mirrors as it is. But once I got it home I thought I would distress it and see what it looks like above my Hubby’s dresser in our room! Good finds this week – but with the pool now open I am going to have to come up with a better layout for working on my upcoming projects so I don’t block the path to the pool… Which means Hubby will need to clean out the garage – and that is another blog and another story! What pieces have you been working on this week? I am featuring this post this week on the Winthrop Chronicles weekly Link party.